The Parkway in La Mauricie National Park in Quebec, Canada is a beautiful place to be during the Autumn months, moreso on an evening with a full moon. The illumination from the full moon highlights the Autumn colored forest which displays its red, yellow, orange and green hues. The parkway through La Mauricie National Park is 63 kilometers in length bordered by a dense forest, lakes, campsites and picnic areas. Many people find the park a beautiful place to spend summer holidays while others find the peacefulness of Autumn more appealing. An evening drive through the La Mauricie National Park in Quebec, Canada during the Autumn when a full moon rises over the treetops is picturesque. Full moon seen from along the Parkway in La Mauricie National Park, Mauricie, Quebec, Canada. 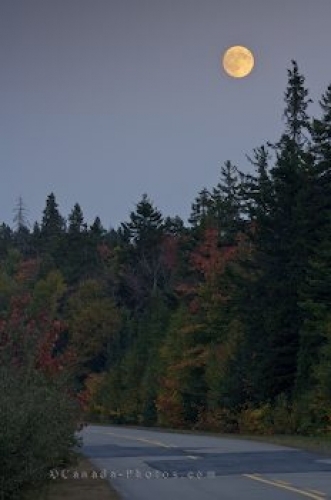 Picture of a full moon during Autumn in La Mauricie National Park in Quebec, Canada.